"Satellite Of Love" was a non-album single first released by Morrissey on 2 December 2013. The single was released in various formats in tribute to the writer and performer of the original version, Lou Reed, who died on 27 October 2013. "Satellite Of Love" was recorded live at the Chelsea Ballroom at the Cosmopolitan in Las Vegas on 25 November 2011. 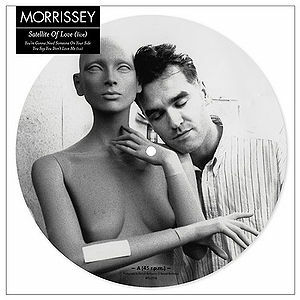 All formats included a remastered version of "You're Gonna Need Someone On Your Side", the opening track from Morrissey’s 1992 album Your Arsenal, which was produced by guitarist and arranger, Mick Ronson (whom also co-produced Reed’s original ‘Satellite Of Love’ and its parent album, Transformer). In addition, all formats featured various previously unreleased live tracks including: "All You Need Is Me", "Mama Lay Softly On The Riverbed", "Vicar In A Tutu" and a cover of Buzzcocks’ "You Say You Don't Love Me"; all recorded live in Hyde Park, 4th July 2008. 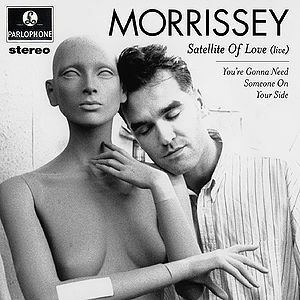 "Satellite Of Love" was initially released as a digital single on 2 December 2013. The single was released on various vinyl formats on 18 January 2014. This page was last modified on 11 December 2015, at 21:01.